Clayton Kershaw allows three hits, strikes out 14 and drives in the winning run against the Padres. LOS ANGELES — Clayton Kershaw pitched a three-hitter, struck out 14 and singled home the game’s only run, leading the Los Angeles Dodgers over the San Diego Padres 1-0 on Sunday. Kershaw (3-1) ended the Dodgers’ six-game losing streak by pitching his 13th shutout and 22nd complete game in 248 career starts. The three-time NL Cy Young Award winner walked none and retired the first 14 batters. Kershaw also hit an RBI single in the third inning off Drew Pomeranz (2-2). 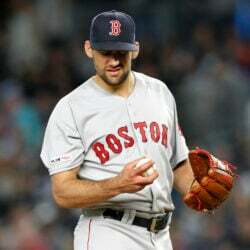 Pomeranz gave up three hits in seven innings. GIANTS 6, METS 1: Madison Bumgarner pitched through rain to extend his Citi Field scoreless streak to 18 innings, Hunter Pence homered and drove in three runs, and San Francisco ran at will against Noah Syndergaard in a victory that stopped New York’s eight-game winning streak. BREWERS 14, MARLINS 5: Chris Carter went 3 for 5 with two homers and three RBI to lead Milwaukee’s season-high 18-hit barrage, and the Brewers beat Miami in Milwaukee to snap the Marlins’ seven-game winning streak. NATIONALS 6, CARDINALS 1: Max Scherzer pitched seven strong innings to beat his hometown team for the first time, and Washington completed a three-game sweep of the Cardinals in St. Louis. REDS 6, PIRATES 5: Scott Schebler hit an RBI double in the 11th inning and Cincinnati snapped a six-game losing streak with a win in Pittsburgh. ROCKIES 6, DIAMONDBACKS 3: Nolan Arenado hit his major league-leading 11th home run and Gerardo Parra also connected as Colorado beat Arizona in Phoenix for a three-game sweep. BRAVES 4, CUBS 3: Daniel Castro singled and scored on Nick Markakis’ sacrifice fly in the 10th inning, and short-handed Atlanta picked up a rare victory by beating the major league-leading Cubs in Chicago. 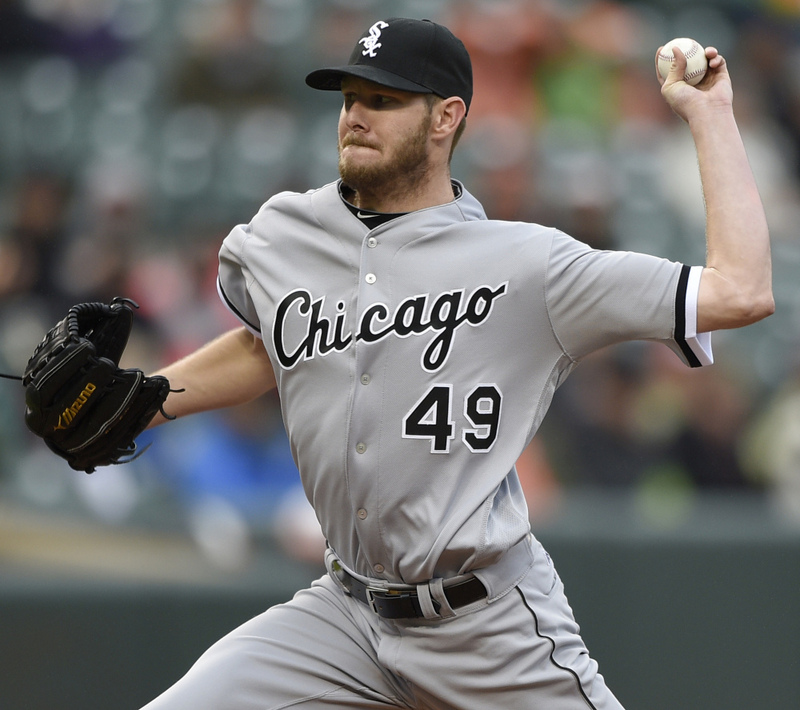 WHITE SOX 7, ORIOLES 1: Chris Sale took a shutout into the sixth inning, Brett Lawrie homered for the third straight day and Chicago won in Baltimore for a split of the four-game series. BLUE JAYS 5, RAYS 1: Marcus Stroman allowed one run in eight innings on his 25th birthday, Troy Tulowitzki hit a three-run homer during a four-run ninth and Toronto beat Tampa Bay in St. Petersburg, Florida. TIGERS 6, TWINS 5: Jarrod Saltalamacchia doubled home the go-ahead run in the eighth inning, Nick Castellanos hit a three-run homer and Detroit stretched its winning streak to five with a win in Minneapolis. ANGELS 9, RANGERS 6: Kole Calhoun got three hits and drove in two runs as Los Angeles avoided a series sweep, winning in Arlington, Texas, and ending the Rangers’ four-game winning streak. ROYALS 4, MARINERS 1: Eric Hosmer homered, Ian Kennedy took a shutout into the sixth inning, and Kansas City ended a long scoreless streak and a five-game skid with a victory in Seattle. ASTROS 2, ATHLETICS 1: Jose Altuve homered leading off a game for the fourth time this season – one of just two hits by Houston – and the Astros beat Oakland in Houston. PHILLIES 2, INDIANS 1: Vince Velasquez tossed two-hit ball over six innings and Philadelphia won at home for its sixth straight win.